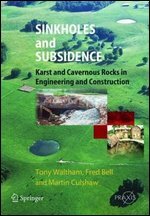 Sinkholes and Subsidence will provide a twenty-first century account of how the various subsidence features in carbonate and evaporite rocks cause problems in development and construction, in our living environment. The authors consider the various methods used in site investigations, both direct and indirect, to locate the features associated with these associated hazards and risks, highlighting the value of hazard mapping. Various ground improvement techniques, such as grouting, and the special types of foundation structures which deal with these problems are covered towards the end of the book. This book is supplemented with a wealth of actual case studies and solutions, written by invited experts. Sinkhole Danger! How to tell if there could be one in your yard.